Hi again. Welcome back to www.engvid.com. I'm Adam. Today's lesson is hopefully very useful to all of you. 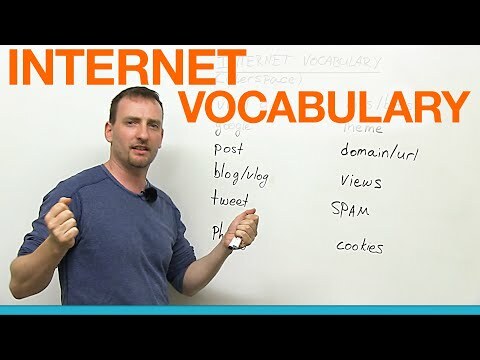 We're going to look at Internet vocabulary, how to survive in cyberspace. Just in case you don't know, "cyberspace" is the Internet, the Internet world where everything happens. These are some very common words you'll see today. Where'll you see them?Everywhere. You'll see them in news reports, articles about entertainment, sports, finance, business -- everywhere. Because the Internet is everywhere, okay? Cyberspace -- huge. So let's start. "Viral", okay? This is an adjective. When something "goes viral" -- "to go viral". When something "goes viral", it means it spreads very quickly. So for example, I think all of you probably by now have seen Miley Cyrus shake her thing, as it were. That video of her shaking herself went viral. It became a huge hit. Thousands, millions of people saw it all over the world. I think another example is PSY. You know the "Gangnam Style" thing? I'm not going to do it for you; don't worry. But he went viral as soon as his video came up. Keep in mind it goes with this verb. "It went viral." "It will go viral." Many books about how to create a viral video, for example. So it's usually images, videos, sometimes articles, depends on what topic it is. I know that you know what "Google" is. Everybody knows Google. "Google" as a noun is the name of a company. It comes from a big number. I'm not going to try to say it because it's too big for me to say, but basically, they got this name from mathematics, I guess. But do you know that it's also a verb? "To google", and in the past tense it's "I googled it." And what am I doing right now? "I am googling." Now, some people will write with the "e"; most people will write without the "e". I don't really think it matters all that much. People will understand what you're saying. "To google" basically means "to search". This brand name, the brand name of the company, has become so popular that it is used for any search thing you do on the Internet. If you're using Yahoo!, you're not "yahooing". You're still "googling". If you're using Bing or whatever other search engine, you're probably still "googling" because that's the word that's become common. Completely unrelated: In Canada if you want a tissue to blow your nose, most likely you will ask for a Kleenex. A "Kleenex" is a brand name; it's a company name. Same idea. Google is that huge. "To post" or "a post", again noun or verb. A "post" is something that you put on the Internet, something you put on your Facebook page, something you put on your blog page, on your website. "To post" means "to put up", to put up for the Internet to spread, hopefully go viral, get you a lot of views, which we will talk about in a second. Now, if you keep a blog, then you want to have good posts, and hopefully they will go viral or will come high on the Google search, okay? "Blog" is short for "web log". So "web log"; "blog". Now, what is a "log"? A "log" is like a journal or a diary. So a "blog" is usually a personal website where people put whatever they want: comments or ideas or pictures or whatever or videos, in which case it's a vlog -- a "video log". And what you want... you're going to post your articles or your ideas, and you want people to come and see them. You're sharing this with the world. A "tweet" comes from the company Twitter. A "tweet" is a short message, 140 characters or less, so letters, spaces, dashes, etc. It's something that you share with whoever you want, whoever follows you on Twitter. You tweet this. Sometimes people will "retweet": They will take your tweet, your message, and send it out to more people. So hopefully, if many people see your tweet, maybe it will go viral and the whole world will see it. Maybe. "Phishing"." Phishing" is a very interesting phenomenon, okay? What people do is they send you an email, and they hope that you will respond and give them information: bank accounts, passwords, usernames, etc. So they send you a letter saying, "Oh, hi, you know. I'm your bank. There's a bit of a problem with your credit card. Can you send me your credit card number and expiry date and the code on the back just so I can make sure that it's actually not a problem?" Well, that's the problem. Be very careful of phishing. It sounds like "fish" because they're sending you a bait, they're sending you a little worm and hope you swallow it. Don't, okay?